The Republic of the Maldives is a chain of around 1200 islands stretching 750km across the Indian Ocean. The exact number of islands varies according to the season and method of classification - islands come and go with the wind, waves and currents! These tiny islands are geographically grouped into atolls, of which there are 26. Maldivian people inhabit only 200 islands and 88 have been developed into tourist resorts. Year round there are blue skies with warm, humid weather although there is a dry season (northeast monsoon) and a wet season (southeast monsoon). Historically the Maldives is a small, isolated and peaceful nation. Extremely proud and independent, it has guarded against many would-be colonisers. Its pre-Muslim past is somewhat hazy but full of heroic myths based on inconclusive archeological discoveries. The Government has taken steps to reduce the impact of tourism on the local community, so tourists can only be accommodated on registered tourist islands and visits to other islands are restricted. However the Maldives economy thrives on tourism. It is a full member of the Commonwealth. The ultimate way to experience the diverse array of diving Maldives has to offer, is aboard one of the charter live-aboard vessels operating in these tropical waters. The Maldives archipelago is located on top of the Chagos-Maldives-Laccadive Ridge, a vast 960 kilometre long submarine mountain range in the Indian Ocean running north to south. Each atoll is made of a coral reef encircling a lagoon, with deep channels dividing the reef ring. A string of islands take their place among this atoll ring; with each island encircled by its own lagoon and coral reef. The islands are small, and low-lying and have no rivers or mountains. The capital and largest city of the Maldives is Malé, located at the southern edge of North Malé Atoll. Some atolls can be reached by speedboat from Male whilst others require a flight transfer. Water lovers and beach goers come to the Maldives to enjoy the ideal snorkeling conditions along the reefs besides the calm, clear blue lagoons. Magnificent diving opportunities abound with the possibility of seeing whale sharks, manta rays and hammerheads. A highlight is snorkeling with the manta rays and whale sharks at the UNESCO Biosphere Reserve at Hanifaru Bay on Baa Atoll which has become one of the world’s largest manta ray feeding destinations. Up to 200 manta rays and dozens of whale sharks feed on the plankton blooms between the months of May and November. Surfers come to get their stoke on in the Maldives. Other watersports include windsurfing, catamaran sailing, parasailing, kite surfing, kayaking, water skiing and jet skiing. Resorts can arrange excursions to the villages on inhabited islands to experience the Maldivian lifestyle and culture, night fishing excursions and trips to uninhabited islands and sand banks by traditional Dhoni (Maldivian motor boat). Many resorts have relaxing spa and wellness treatments to indulge in and offer romantic, magical and memorable honeymoon packages. The Maldives has a tropical-monsoon climate, with typically sunny days and a constant average year round temperature between 28°C to 32°C. This is the season to dive on the western side of the atolls. Regular encounters with large schools of pelagic fish like sharks, eagle rays and tuna are common. This is the best time of year to see manta rays and whale sharks on the eastern side of the atolls, although visibility is lower. It is also a good time to see grey reef sharks and hammerheads. The congregation of manta rays feeding at Hanifaru Bay in Baa Atoll is best seen between August and November. The water is slightly cooler during the southwest monsoon (around 26-27°C). June and July tend to be the wettest months. The winds are stronger and the seas are a little rougher. From December, fast currents begin to flow from the northeast. Visibility is excellent, the seas are calmer and the action on the eastern side of the atolls consists of sharks and other pelagic species. The currents are strongest in January then start to ease into February and wind and wave action slackens. March and April are the doldrums making diving easier in these two months. Manta rays and whale sharks will only be found on the western side of the atolls throughout the dry, summer season. Water temperature averages around 28-29°C except in the far south where the water temperature can drop to 24°C. Maldives is also a popular surfing destination. The surf season runs from mid February to November. Early in the season has the most stable weather with light winds. March, April and May have very clean conditions. In March and April, conditions are best in the Southern Atolls whilst from May to October the best surf is in the Northern or Central atolls. The biggest waves with offshore wind conditions occur from June to August, although tropical storms may occur in these months. September and October have consistent swell with less variable winds and storms whilst November has small to medium size waves. A complex formation of reefs has evolved from a huge volcanic mountain range. Ocean currents have eroded the atolls’ rims creating Channels or “Kandus” that allow water to flow in and out of the atolls to the open ocean. The Channels are deep and narrow, home to larger species feeding on smaller reef life and plankton which is swept through the channels by the ocean currents. The main attractions on Channel dives are the pelagics such as Eagle Rays, Dog Tooth Tuna, and schooling Grey Reef Sharks. Small areas of coral rising up to the shallows, known as “Giris”, and mountainous pinnacles rising from 35 metres to 5 metres, known as “Thilas”, can be found inside the atolls. Thila’s are hotspots for schooling pelagics coming up the steep pinnacles to hunt for reef fish. Dog-tooth tuna, jacks, eagle rays, grey reef sharks, trevally and thousands of red-tooth trigger fish, blue striped snappers, and fusiliers bombard the Thila’s when the currents are running. Circular Reefs or “Farus”, normally located in the ocean channels, rise up from the ocean floor. Usually between 1 – 30 metres deep, these reefs generally offer the easiest diving in the Maldives and is where you will find fan corals with macro life such as moray eels, nudibranchs, frog fish, leaf fish and glass fish. The Maldives is also known for its Manta Cleaning Stations. Here you will find sometimes up to 20 manta rays gracefully hovering over the cleaning station, while cleaning wrasse nibble away at unwanted parasites. In the immediate vicinity of Male the diving is very good but visibility and encounters with large pelagic fish increase in the outer atolls. 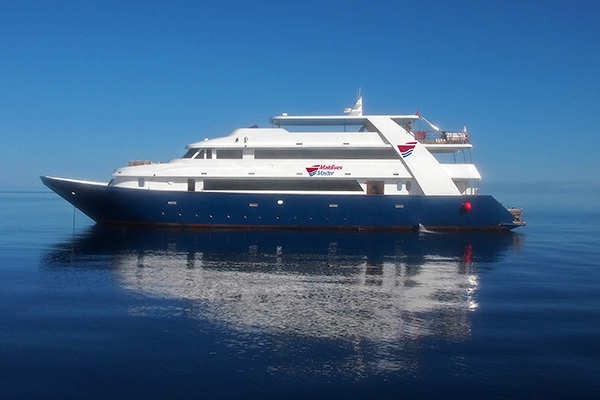 Liveaboards are an excellent option. Inside the atolls the currents are weak but on the side facing the open ocean currents can be very strong. Reef life is most prolific on the point of the current and the possibility of spotting macro life is high. There are a few wrecks but Maldives is most famous for its pelagic life - manta rays, whale sharks, reef sharks, hammerhead sharks and turtles are found in the Maldives year round. The Republic of the Maldives is a chain of around 1200 islands stretching 750km across the Indian Ocean. The international country code for Maldives is +960. Maldives are 5 hours ahead of Greenwich Mean Time (GMT). Visas are not required in advance but are issued on arrival. Travelers will be issued a 30-day visa. All tourists are required to have a passport with a minimum of 6 months validity from the date of departure, onward or return airline ticket or sufficient funds to purchase tickets and cover their expenses during their stay. Dental, doctors and hospital services are available in Male. There is a recompression chamber in Male. Malaria free, however there is a small possibility of dengue fever. (For further details please contact Travel Vax on 1300 360 164). The Maldivian currency is Rufiyaa (100 laari = 1 Rufiyaa) but is rarely used on tourist resorts. Most transactions are made in US Dollars but other currencies are accepted. Travelers cheques and major credit cards are widely accepted but 5% may be added for credit card transactions. Banks in Male will cash travelers cheques into US Dollars and Rufiyaa may also be purchased. ATM’s can be found in Male. Sri Lankan Airlines: 20 kg per person. Singapore Airlines: 30 kgs per person. Please contact Dive Adventures for excess luggage requirements. Northeast Season:December-April (dry monsoon). Southwest season May-November (wet monsoon). Temperatures are around 30˚ C and humidity is 60-80%. Cyclones are rare but possible in April/May and October/November. Cover yourself properly when visiting inhabited islands and Male. For men shorts and a shirt are acceptable. Women are expected to cover their bodies and thighs. Swimming trunks, bikinis and other beachwear are accepted at resorts but not on inhabited islands. Nudism in public places is prohibited. Bring a sweater for evening as the temperatures can drop. Resorts use 220/240-volt AC at 50 cycles. Plugs are type G or D. (For further details refer to http://www.iec.ch/worldplugs/ ). English is the official language in education, business and government circles. MaldivianDhivehi. Check with resort if tap water is drinkable. Bottled water is expensive. Shops are open until 11pm. Chaandanee Mugu and the Majeedhee Magu are the prime shopping zones in Male, especially for traditional handicrafts. Male International Airport has a selection of clothes and luxury items. 10% service tax is added to everything but tips may be expected when being served personally. Tips should be given directly to the staff personally. Porters at the airport will expect US$1. Ensure that all equipment is serviced and in working order prior to departure. You will need to bring a DIN converter for DIN regulators.3mm wetsuit or lycra exposure protection are recommended (check season). Dive operators supply tanks, weight belts and dive guide services. There will be an extra charge if equipment hire is required. 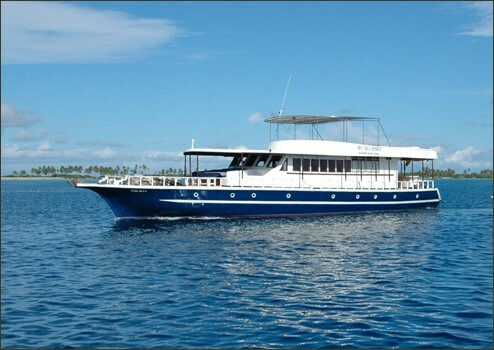 Maldives Aggressor II “Party Like Its 1999 Special"
Maldives Aggressor II "25% Off In 2019 Sale"
Makunudu Island Resort "Early Bird Booking Offers"
Makunudu Island Resort "Summer Special Offer"